Service Animals work to remove barriers that persons with disabilities face every day. The NL Service Animal Act ensures that a person with a service animal has equal access to accommodations, services or facilities. Often times a service animal can be identified by a vest or harness, however, this is not always the case. 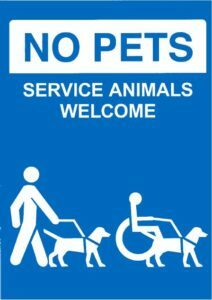 The owner can also provide documentation that confirms the person requires the use of a service animal. Training is available for those who wish to learn more about service animals through the Coalition of Persons with Disabilities – NL 709.722.7011. For specific information on the Service Animal Act, contact the Department of Justice 709.729.5942. If you don’t accept pets in your business but would like some of these signs to show your support for service animals, we would be happy to send some to you to proudly display at your business! Have a quality tip to share with others in the industry? Contact us, we would love to hear from you!